My 2004 Les Paul is almost a stone in weight, at 13 lb+. Is this unusual? It plays, looks and sounds great, but feels much heavier than previous LPs I’ve owned. As I get older, it gets less comfortable over long periods standing. Just wondered if many players on here have Gibsons this sort of weight. Crikey, that's a heavy one. Is it a standard? I had a 2002, never weighed it but I reckon it was about the same as my R8 which is 9lb something or other. Pippy weighed it, I wonder if he remembers. I seem to remember what ever it was it was a few oz heavier than his #1. 13 lbs sounds like 70s weight. It plays, looks and sounds great, but feels much heavier than previous LPs I've owned. As I get older, it gets less comfortable over long periods standing. That is a lot. I have no clue what my LP weighs, but it is weight relieved. It is still a heavy beast. My BB King is no feather either even though it is a semi-hollow. There are always acoustics. Yes, a standard, which I understand would have weight-relief!! To be fair, it has great tones and records great, too, but I must admit to picking something else up if I’m just doodling on the couch. 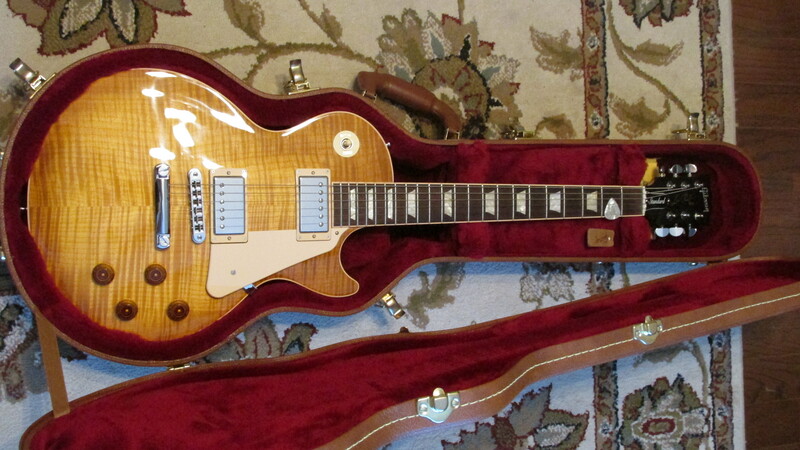 Plan on getting a lighter LP when I have some money, but it is a nice-sounding beast with no other issues. The weight relief in 2004 consisted of 9 holes drilled out of the mahogany body blank. If the mahogany was very dense it could still - and in your case did - mean a heavy guitar. You might want to check out some of the post-2006 Chambered (as opposed to weight-relieved) Standards. Some of these at the lighter end of the scale come in at around 7 1/2 lbs. Thanks, Pippy. The dream is that the next one will be a Custom Shop, hopefully light! Really like the look and sound of a CS 1960 I’ve seen on Wildwood YouTube. Need to look at their weight now. There WERE a few Custom Shop re-issues made in around 2007 / 08 which were also chambered - the so called 'Cloud 9' guitars - which are even lighter than a regular re-issue. They are not in plentiful supply and are a bit of a mystery in many ways but it's something worth bearing in mind. They are designated (IIRC) by a CR (Chambered Reissue) prefix to the serial number. FWIW from what I've seen over the last ten years or so the average for a regular '59 R-I is around 8 lbs 13 oz just as a comparison for what you discover in the hunt. It’ll be like a feather! The guitar itself, though, is so good that I almost feel guilty for moaning about its weight. Wow. 13lbs.! That's a big boy. My 2018 Les Paul Classic is a solid 10.6 lbs and I get a little lean to the left when I play it. Can't imagine one weighing 13lbs. This was my first "heavy" guitar and in the future I will definitely pay more attention to weight. Yes, original owner and never had any water damage or anything like that. Out the case, played, back in the case. I bought a used Rickenbacker once, that smelled that way. Never thought it might have been something to do with water, but that figures! Sounds extremely heavy for a 2004. I have one close to 11 lbs, and another just around 9.
it is REAL how much heavier the 10+ pounder feels compared to the other one. Scales we use at home for suitcases before flights, so I am pretty confident they're as near as dammit. Funnily enough, a guy downstairs has just got a new Les Paul Standard, and invited me to try it. It didn't feel that much lighter. What's the going rate for weight these days? Like the adult diapers - Depends. I got a new 2017 Standard T a year ago - it has "ultra modern weight relief", sounds great and weighs just a little over 7 pounds. I also have a LP Custom Lite from 2012 and the Standard while thicker doesn't weigh very much more than the Custom Lite. 13 pounds is too much for an old guy like me to gig with. I'm sure it sounds wonderful, but I would only last maybe one set with one that heavy. Have fun in your search for a lighter one.